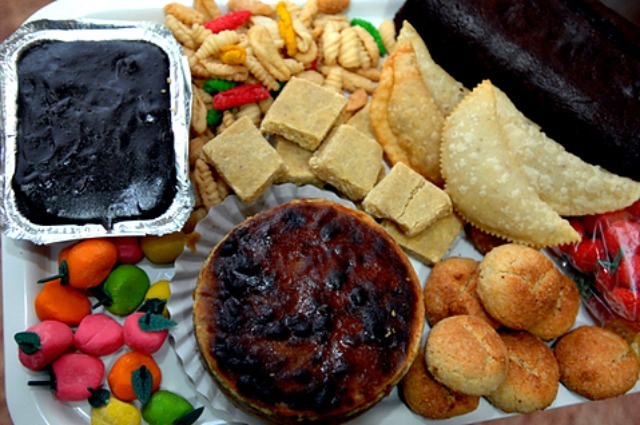 No Christmas in Goa is complete without the Christmas Sweet Platters made up of Neureos, kulkuls, Bebinca, Dodol, Doce, Kokada, Jujups(Sugar coated square gummies) and Marzipan (made of cashew’s). 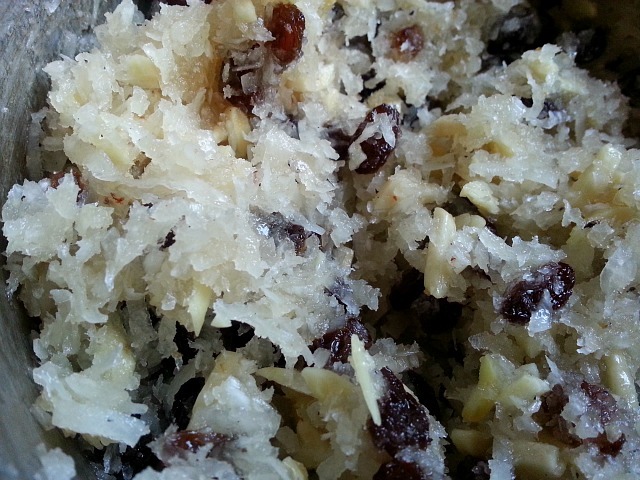 Coconut plays a major role in the Goan Christmas sweet making. 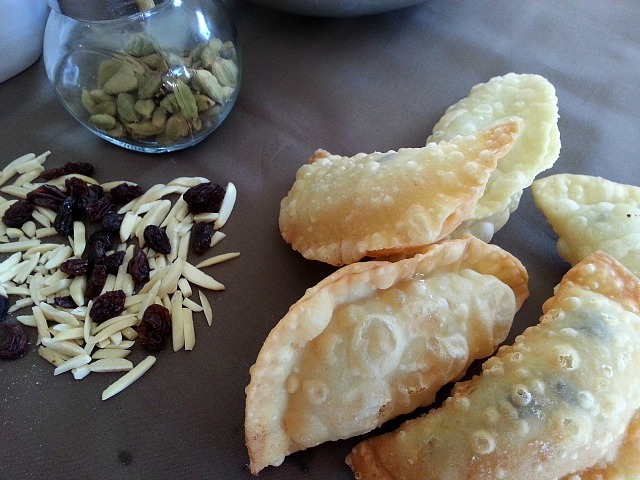 In Goa Christmas sweet making preparations would start a week to 10 days early. Since my mom was a working mother it was fun for us to watch her and the hired help make each sweet separately after school. The smell of the deep-fried Neureos, Kulkuls would make our mouths water. Before the start of the sweet preparations tradition called for a dough cross to be fried first so that all the preparations and hard-work would be blessed with a tasty outcome. 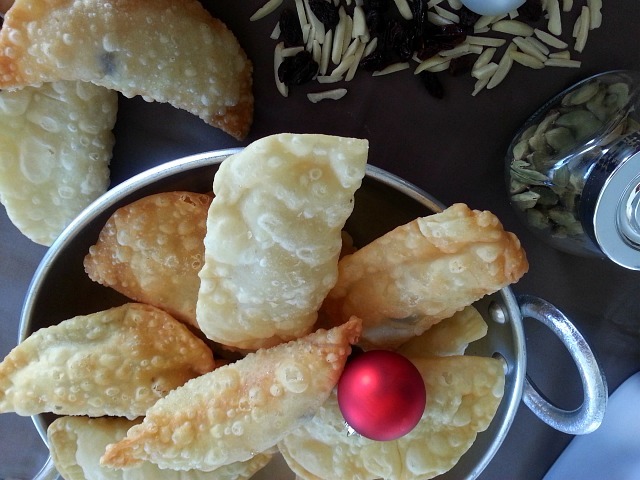 Traditions also called for making a lot of the sweets to share and exchange with immediate family, friends and close neighbors which is called as consuada. But these traditions are now a dying traditions as people are more busy and ready to eat Goan Christmas sweets are much more easily available in the markets. My recipe of neureos may be different from others. There are variations in the dough where cream of wheat is added for a slight crunch to the crust and the filling is made with roasted cream of wheat along with the grated coconut. I have cut the sugar as I do not enjoy my sweets or desserts to be too sweet and I have not included the cream of wheat in the filling. If you would like to add to my recipe the please do in the comment section. I would love to hear how you do yours. On medium heat make a syrup of sugar and water. Add coconut, nuts and stir till the mixture thickens. Then add the raisins, crushed cardamoms and cook till dry while stirring continuously on medium heat. Set aside and let cool. 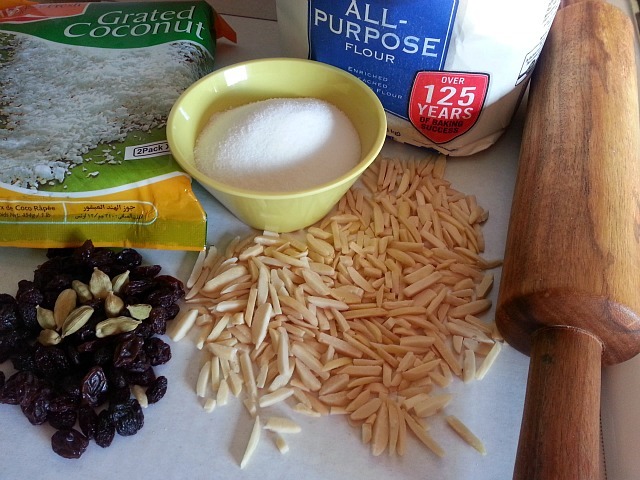 Divide the mixture in equal portions about approx 35-40. Mix all the above ingredients together till a nice soft dough is formed. Let stand for 1 hour. Divide the dough in equal parts approx 35-40 round ball pieces. Cover with a moist towel so that the dough balls do not dry. Then roll each dough ball to be an approx 4″ circle. Add the filling to the circle. Fold to a half-moon shape and seal the open ends with your fingers dipped in water. Press with the edge of your fork for a decorative look. Deep fry till lightly browned and crust is crispy. Cool and enjoy with a nice cup of tea. Previous Previous post: Tisreo Xec Xec – Clams in Curried Grated Coconut. I grew up on North Indian food and once I started being able to eat out on my own I realized how much I was missing out on. I absolutely love South Indian food and coconut is one of my favorite flavors. I’ll try to make something like this (I don’t have all the ingredients) next weekend!! Thanks for sharing. That is so awesome to know that you will give this a try. Thank You! Oh….I absolutely love coconut these sound so different and delicious. Thank you for sharing. These are glorious! What do folks with gluten and bloid sugar issues do? Seriously! Thank You so much. It is a sad situation to be in, hope I had an alternative. OMG! Looks delish! And there is nothing I won’t put in a wonton wrapper. Thanks for sharing! Definitely trying this one! Thanks for liking my blog! I absolutely love your posts, too, and am always envious of the things you make. Aquileana, yes I know Empanadas, love them. In Goa we have something similar made with pork we call it Empadinhas. Happy New Years! wow – my grandmother did prepare this dish today, delicious! I hope you do give it a try someday. It’s like eating a deep fried crunchy sweet wonton. Oh, wow, these look delicious! Made me hungry just to read this (LOL). Thanks for sharing! Have a good holiday. Yes that’s right, my friend from Delhi mentioned it to me :-). Wow, do those look delicious! ooooh yes please! 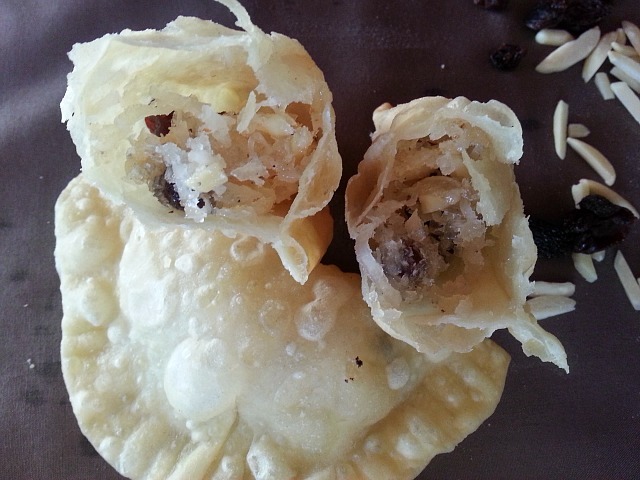 These fried coconut dumpling are amazing!! The neureos are making my mouth water. They are also called nevris in Konkani, right? I really enjoyed reading about making the sweets for Christmas and the traditions. Wishing you too Happy Holidays! The locals call it both ways, just depends if you grew up in the south or north part of Goa. I am happy you enjoyed the post :-). Tc n Regards. Yummy, these look especially good! These look delicious! And what are the other items on the tray? The colored fruits look like marzipan, and maybe there is also a tart with caramelized sugar on top? Wow! Lots of treasures there. I see some European influences, as with the plum cake and marzipan, but with local ingredients ingeniously used. You have made me very hungry! The idea of cashew marzipan is really interesting. I will have to check into that. This sounds yummy and my hubby loves coconut desserts. Since I’m Celiac, I’d have to modify the recipe but I’d be willing to give it a try. Thank you for sharing. Thanks. That’s very helpful. I’ll pin this to my Pinterest page so I don’t lose it. Thanks for stopping by my blog once more. Can’t wait to try making these! They look and sound delicious!! Thank You Cindy, It does put you in the Christmas mood :-). wow – this is always impressive recipe, you always remind me of my grandmother preparing those delicious dish!